In this week’s Play of the Week we are again discussing DOGSO (Denying an Obvious Goal Scoring Opportunity). As all three plays occurred outside of the penalty area, the law change does not apply. Rather we are examining the law and the considerations that apply. This week I would like you to apply the law criteria and fill in the blanks. The most accurate and best explanation will win a prize. 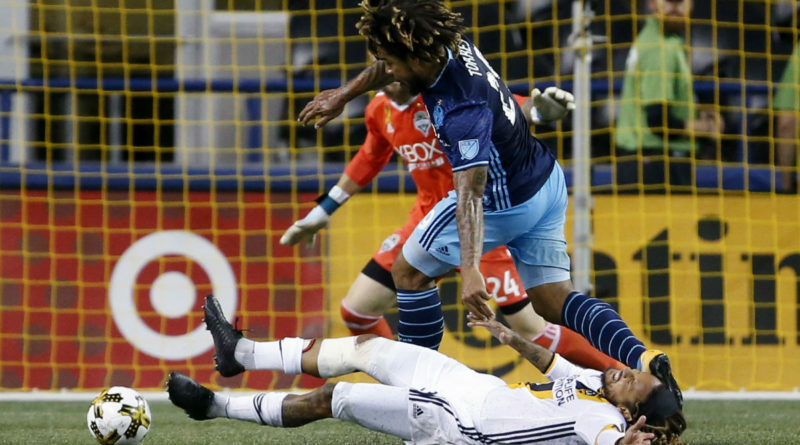 As Galaxy and US international Jermaine Jones is moving towards goal he is judged to have been brought down by Sounders defender Roman Torres. Jones then loses possession of the ball. Here the main consideration is the “location and number of defenders”. Is Seattle defender Chad Marshall close enough to have made a challenge? As Red Bulls’ prolific striker Bradley Wright-Phillips is moving towards the goal, he is pushed by Fire’s Jonathan Campbell. Once again in this play, the main consideration is the “location and number of defenders”. Is Chicago’s Johan Kappelhof close enough to make a challenge? NYC’s Maxi Moralez is pulled down by Timbers’ David Guzman. As in the previous two clips the main consideration that is up for discussion is the “location and number of defenders”, namely Timbers’ Roy Miller and Larrys Mabiala. New York City players are appealing for a red card, and Moralez is showing an imaginary red card. If IFAB are demanding that a player giving a Video Review signal receive a mandatory yellow card, then surely a player showing a card signal should also be given a mandatory yellow card? The referees in these clips, Drew Fischer, Alan Kelly and Ismail Elfath, respectfully have to go through all of the considerations in order to make an accurate decision. There is little doubt in all three of these plays the criteria of distance, direction and control are satisfied, the criteria of “location and number of defenders” may be potentially difficult to judge. Now this is where you have to decide. Put yourself in the referee’s shoes – can you make the correct call? Please do not take into consideration Video Review. It is very unlikely that DOGSO calls would ever be overturned as they are subjective judgment calls and would rarely fall into the category of clearly wrong. Good luck. I look forward to your entries and will announce PRO’s answers and the winner of the prize next week.